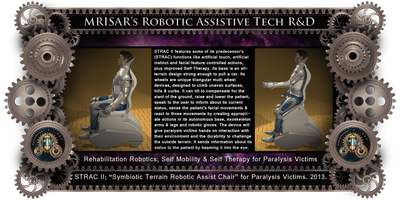 "STRAC II: Symbiotic Terrain Robotic Assist Chair"
MRISAR’s STRAC II: Symbiotic Terrain Robotic Assist Chair for Paralysis Victims. It is a "Facial Feature Controlled Robotic Device with Artificial Sense of Touch". STRAC II is a streamlined, light weight version of STRAC which was designed and built in 6 weeks and was one of the select few Rehabilitation Robotic Prototypes that were demonstrated before the "International Conference On Rehabilitation Robotics" "(ICORR)" at Stanford University, in California, 1999. STRAC II is forty percent lighter and has increased dexterity and modes of operation. The ultimate design will literally form to the patient’s body and be light enough to be easily handled. It will provide self-therapy as it is able to gently manipulate the basic physical movements of its human occupant. This project and our prior prototypes are based on augmentation of human capabilities. Specifically these include our version of “Facial Feature Control”, “Neck Movement Control”, “Artificial Touch”, "Artificial Instinct" and “Status Indication through Direct Focus on the Retina”. It can use 3 or 4 facial feature movements to utilize 40 different basic functions which is expandable to hundreds, while relating its status through a visual indicator. In practical terms this design is easy to control and allows multitasking. 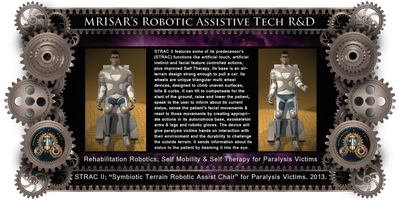 Because of lack of funding STRAC II is still in its early stages of prototype development. STRAC II features some of its predecessor's functions like artificial touch, artificial instinct and facial feature controlled actions, its improvements include Self Therapy. Its base is an all-terrain design that is strong enough to pull a car. Its wheels are unique triangular multi wheel devices, designed to climb uneven surfaces; hills and curbs. It can tilt itself to compensate for the slant of the ground, raise and lower the patient, speak to the user to inform about its current status, sense the patient’s facial movements and react to those movements by creating appropriate actions in its autonomous base and two exoskeleton arms and robotic gloves. The device will give paralysis victims hands on interaction with their environment and the durability to challenge the outside terrain. It sends information about its status to the patient by beaming it into the eye. 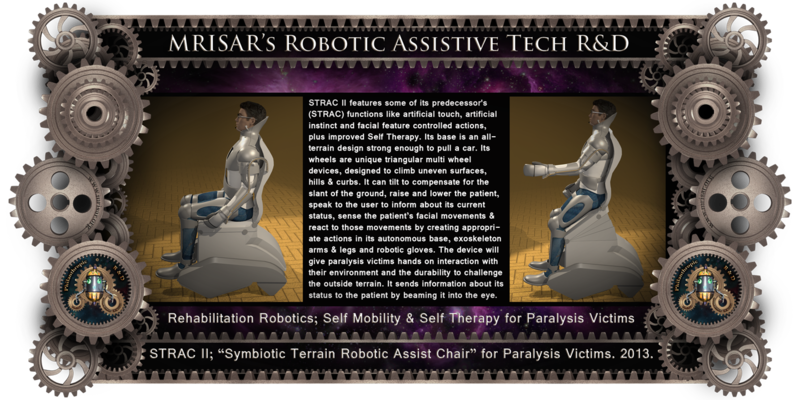 Note: STRAC II is designed to adapt to the worst cases of paralysis when only a few facial features can move, but is adaptable to other levels of paralysis and industrial emergency applications as in telepresence control using the sensors on the device. 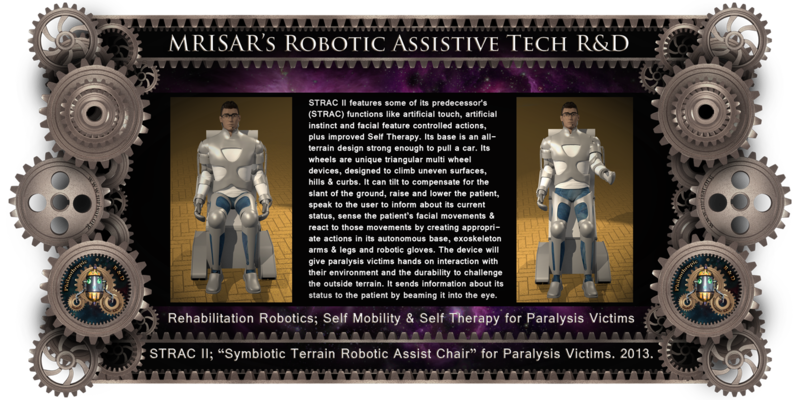 We were the only entrepreneurs to be chosen world-wide to give an international presentation and publication of our research and development in rehabilitation robotics before IEEE’s “2003 RO-MAN” International Conference on Rehabilitation Robotics; (Adaptive Technologies for the disabled). The presentation was in person at the conference. 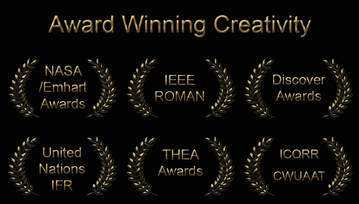 From there it was presented via web and viewed globally at major Universities and other facilities. STRAC II was part of our presentation. It was published by IEEE - RO-MAN 2003, 12th International Workshop on Robot & Human Interactive Communication: Sponsored by: IEEE Industrial Electronics Society, Robotics Society of Japan, Hosei University, Hosei University Research Institute, California, New Technology Foundation. Technical Sponsors: IEEE Robotics and Automation Society, Virtual Reality Society of Japan. With Additional Support from Faculty and Staff of: Stanford University, VA Palo Alto Health Care System, Immersion Corporation, Intuitive Surgical Inc.
Our work in adaptive tech R&D and other subjects is world renowned and awarded, however so far we have had to fund it ourselves. 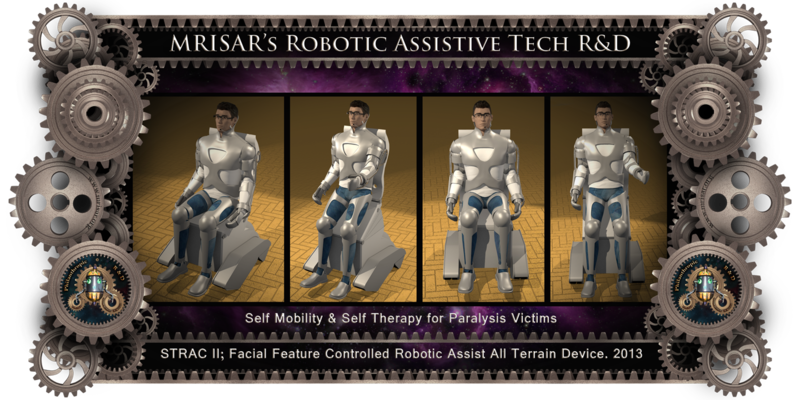 MRISAR’s “Facial Feature Controlled Technology and Artificial Sense of Touch Technology was awarded, published and presented before ICORR 99; International Conference On Rehabilitation Robotics: their project was 1 of the 5 Rehabilitation Robotic Prototypes to be chosen World Wide to be demonstrated before "(ICORR)" at Stanford University, California. Their work was published by Stanford University, as part of the proceedings. Their 1990's circa, original innovative research & development in "Facial Feature Controlled Technology" and "Artificial Sense of Touch Technology", (Adaptive Technology prototypes for the disabled), has helped pioneer those fields!